Up to 12.5% discount at UK fish shops!! 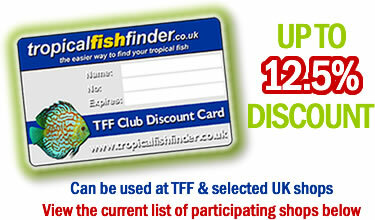 As a TFF Card holder you will be entitled to discounts of up to 12.5% on your fish purchases. In addition, the participating shops may from time to time provide card holders with exclusive special offers and deals. To apply for your TFF Discount Card and receive discounts on your fish purchases at local shops as well as on TFF Books, please complete the form below: This will also register you as a TFF site user. Once you have completed the form you will need to pay online using a credit/debit card. The following discount card prices are available. You need to be a registered TFF user to apply for a TFF Card. Registration is free and easy, just click on the link below to register now and you will be returned to this page. Or if you already have a TFF account click below to login. The following shops are currently offering discounts to all TFF Card members - click a shop name for store details.